Congratulations to Peggy McGahan, who was chosen to be the Featured Artist for the 2017 Nature Artists’ Guild Autumn (Holiday) Exhibition of Natural History Art at The Morton Arboretum in Lisle, IL. This exhibit of Peggy’s work along with approximately 150 pieces by fellow members of the Nature Artists’ Guild will be open to all the weekend of November 4 and 5, 2017 between 10 am and 4 pm. A special reception for guests of the artists, as well as members of The Morton Arboretum will take place on the evening of Friday, November 3, 2017 from 5 until 9 pm. More information about the exhibit to come soon. Please click on the “Featured Artist” tab to read more about Peggy and to view additional examples of her gorgeous artwork. From the Thorns, copyright Peggy McGahan. 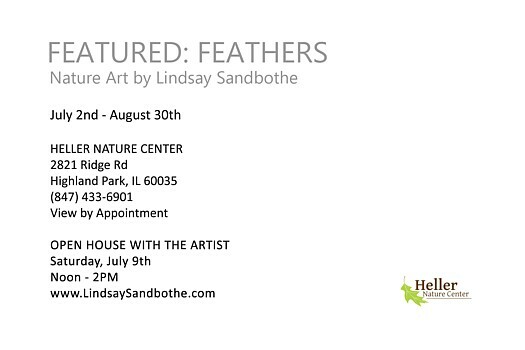 Nature Artists’ Guild member Lindsay Sandbothe would like to extend an invitation to all to visit her new exhibit at the Vogt Visual Arts Center in Tinley Park, IL. This two-person exhibition features the artwork of bird artists Lindsay and Kristina Knowski, and will be open from September 5th through September 30th, 2017. Please click on this link for times and driving directions. An artists’ reception will be held at the Vogt Visual Arts Center on Friday, September 8, 2017 from 7 until 9 pm, and all are invited to attend. Please click on this link to the Facebook event page or this link to Lindsay’s website for more information. Goldfinch, copyright Lindsay Sandbothe. Used with permission. Jill Adzia is the current Chairperson of the “Ways and Means”, or Fundraising Committee for the Nature Artists’ Guild. Jill has done a fabulous job in this role (as well as numerous others throughout the years), but would like to step down at the end of the year. 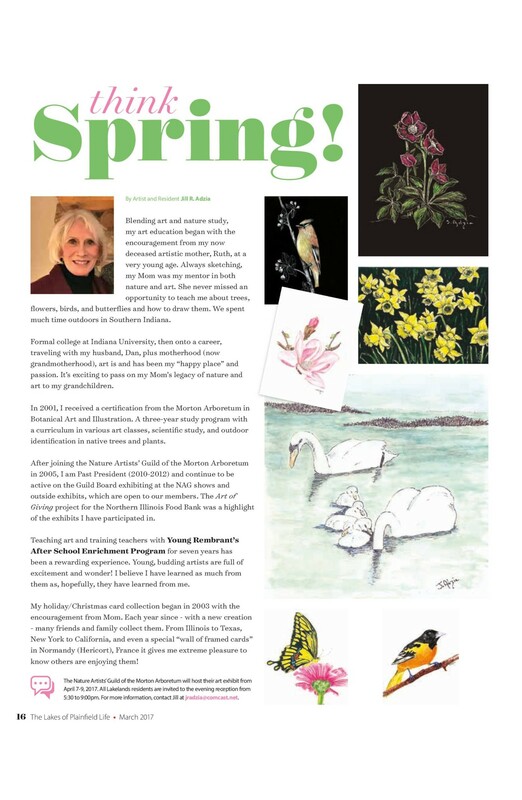 If any member of the Nature Artists’ Guild would like to find out more about working with Jill to learn the role, they are asked to contact Jill, whose contact information can be found in their Yearbook. Laurie Alvear has also been doing a great job as Co-Chair of the Special (Outside) Exhibitions Committee, along with Gary Chipman. Laurie will be moving out-of-state very soon, so the Nature Artists’ Guild is looking for an immediate replacement for that position. Any Nature Artists’ Guild member who is interested in learning more about the position may contact Gary Chipman, Laurie Alvear, or Mary Ann Jimenez, whose contact information will also be found in the Nature Artists’ Guild Yearbook. Volunteering is an enjoyable and fulfilling way to become more involved in the Nature Artists Guild, as well as a great way to forge lasting relationships with fellow artists! Whew! The cooking, cleaning and dishes are done and the guests have left. This might be a great time to take a minute for yourself, and renew your Nature Artists’ Guild membership for 2017! The Nature Artists’ Guild accepts renewals and new members any day of the year, but memberships are for the calendar year, so renewing (or joining) now will ensure that you receive all of the benefits that your membership brings. Current members can pay their 2017 dues by mailing a check to our Treasurer, Nancy Wu (her address will be in the Nature Artists’ Guild Yearbook). Nancy will also be accepting renewal dues at the Holiday Party. New members are asked to mail a check to the address printed on the membership brochure (click here or on the tab at the top of the website to download or print a copy). December 4, 1986 was the beginning of 30 years of programs, 30 years of paint-outs, 30 years of workshops, 30 years of exhibits, and 30 years of creativity, learning, sharing and friendship for members of the Nature Artists’ Guild of The Morton Arboretum. Our volunteer party team has been planning and preparing for months, and they have come up with some exciting ways to combine the celebration of the beginning of the Nature Artists’ Guild’s 30th year with the members’ annual Holiday Party on Thursday, December 8, 2016 from 6 until 9 pm at the Thornhill Education Center of The Morton Arboretum. This event is reserved for current and former Nature Artists’ Guild members and their guests only. 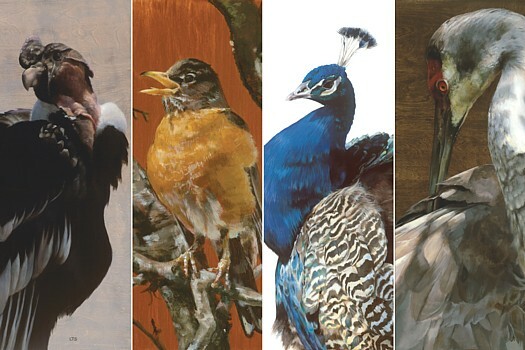 Lindsay Sandbothe’s large-scale paintings of birds on wood have been inspiring awe at Nature Artists’ Guild exhibits for years! Now, Lindsay’s first solo exhibit will feature all of her best artwork in one setting. Please see the postcard below for details about the exhibit and the opening reception on July 9, 2016 from noon until 2 pm. Congratulations, Lindsay!